When you go outside on a cold day, everyone knows you must zip your coat to stay warm. 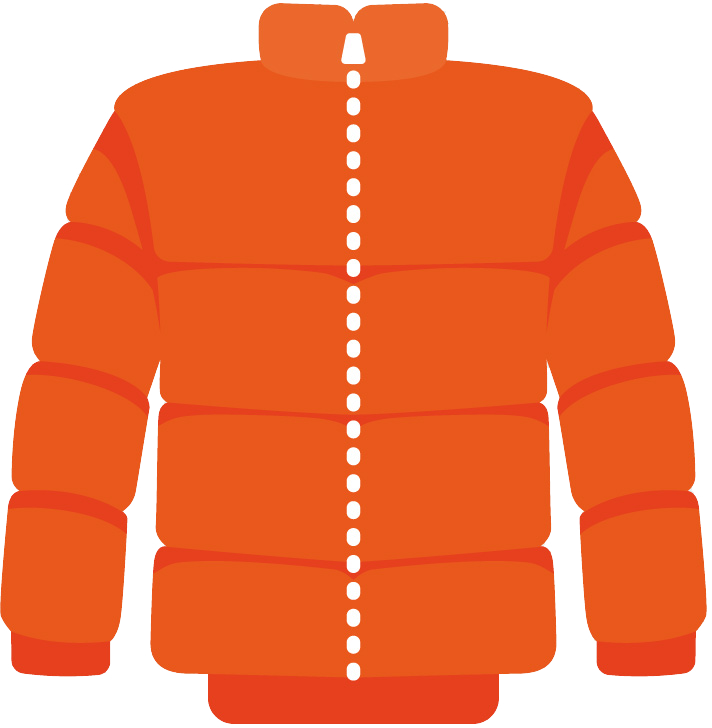 It doesn’t matter how thick the coat is, if it’s left open, your body heat will leak out. The same is true with building insulation – no matter its R-value (thermal performance), if insulation isn’t continuous throughout the building envelope like a zipped coat, heat will escape – wasting energy and money. This is why national energy codes now encourage the use of continuous insulation (CI) systems, which provide an uninterrupted insulation layer over an entire wall, not just in the wall cavities. CI insulates, prevents air leaks & controls moisture! High building envelope air leakage often is the primary energy efficiency failure in modern construction. Another major energy efficiency challenge is thermal bridging which occurs when heat passes through the path of least resistance—through steel and wood studs, for example. In an airtight and insulated home, thermal bridges can account for heat loss of up to 30 percent. Rigid foam acts as a thermal break, keeping heat in (or out) longer. 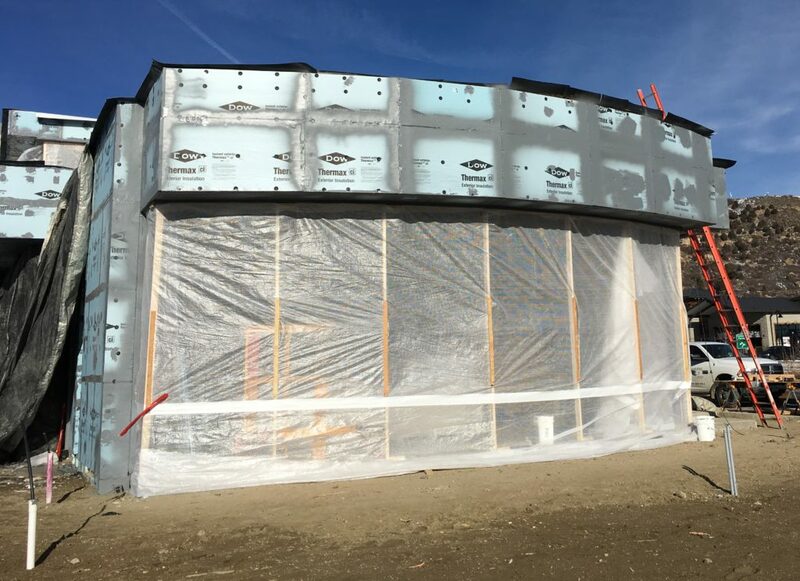 Your local insulation experts at Kinzler Construction Services install continuous insulation over the exterior side of steel and wood studs to counter the problem of thermal bridging. Thermal bridging may also allow unwanted moisture flow that could result in condensation within the wall cavity. Wet insulation can quickly lose R-value, and moisture inside the wall may lead to mold growth, mildew odors and wood rot. Moving the dew point from inside to outside of the wall cavity with continuous insulation is vitally important for avoiding these problems. Kinzler’s building science experts can help determine the best approach for your project. Expert installers from Kinzler Construction Services install CI on a new construction project. 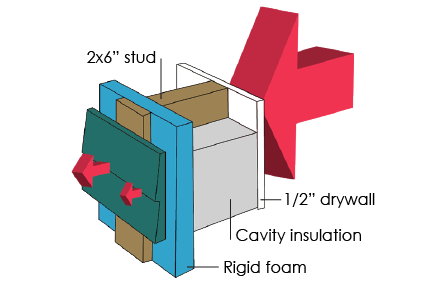 Rigid foam sheathing materials are most commonly used for continuous insulation because of their relatively high R-value per inch and low cost to meet or exceed energy code requirements. There are three primary types of rigid insulation: expanded polystyrene (EPS), extruded polystyrene (XPS), and polyisocyanurate (polyiso). Expanded Polystyrene (EPS) is the most economical type of rigid foam and has an R-value of about R-4 per inch. Unlike other rigid foam insulations, EPS retains its R-value throughout its time in service. EPS is the most versatile of rigid insulations because it can be used anywhere in the building envelope – roof, walls, floors and even below grade since it dries quickly. Extruded Polystyrene (XPS) rigid foam is available in a wide range of thicknesses and edge profiles. The R-value is about R-5 per inch. Used widely in residential construction, this type of rigid foam will not absorb water like polyiso and is stronger and more durable than expanded polystyrene, making it a versatile type of rigid foam. XPS falls between polyiso and expanded polystyrene in price. Polyisocyanurate, or Polyiso (ISO) foam has the highest R-value per inch (R-6.5 to R-7) of any rigid insulation, and is the most expensive. This type of rigid foam usually comes with a reflective foil facing on both sides, so it can also serve as a radiant barrier in some applications. It is used widely in commercial applications and increasingly in residential structures. Continuous insulation offers more R-value, more savings on utility bills, and more thermal and moisture protection. And with no need for housewrap, there’s one less trip around the house, saving labor costs and time. It’s been calculated that a 2×4 wall with R-13 insulation in the cavity actually has a whole-wall R-value of only R-11, and a 2×6 wall with R-20 insulation is actually performing at R-15.67. So… What happens when we add rigid insulation to the exterior? 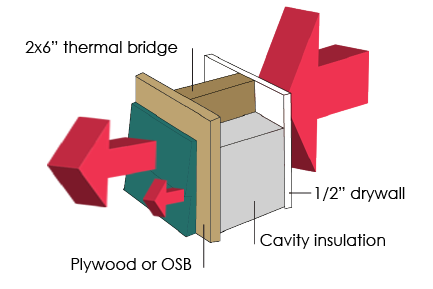 Let’s take a 2×4 wood framed wall with R-13 fiberglass batt insulation in the cavity and R-5 on the exterior to minimize thermal bridging and air infiltration. The combined R-value is R-17.26, while a 2×6 wall without external insulation measures R-15.67. So the 2×4 wall with continuous insulation actually performs better than the 2×6 wall without continuous insulation (CI). Contact us to get a free estimate to find out if continuous insulation is the cost-effective solution for your project. The importance of properly installed continuous insulation in modern building construction cannot be underestimated. Kinzler Construction Services has a team of building science experts and professional installers ready to help you build a high-performance, cost-effective and durable wall assembly solution. Contact us today! How can Kinzler Help you?